When I saw that J.D. Salinger had died, all I could think was, this is a big one. With J.D. Salinger's death the presses are going to stop. There are going to be buckets of ink. Miles of columns! Millions of gigabytes, or however you measure literature on the Internet. There is nothing that gets journalists fired up like the death of a writer. Most journalists, whatever their media, were English majors and so the attention paid to writers is gigantic and often, I suspect, disproportionate to the general public's interest in these people. There were a few newspapers where, I was lucky to get Leonard Pennario mentioned when he died. But oh, if he were a writer, things would be different. I read "The Catcher in the Rye," and I know how influential it is, and sure, everyone has to read it in school, whereas no one has to listen to Chopin. But being into music as I am, this situation gets me sometimes. Sort of the way it gets me that so many novels are about college professors, anthropologists, researchers, grant recipients, other assorted eggheads. That is what writers know about so that is what we read. My mother and I were discussing J.D. Salinger's death and here is how our conversation went. Mom: "I heard J.D.Salinger died." Me (pouring wine): "Yeah, what was he, 92? I didn't know he was that old." Mom: "Oh, he was handsome. This was before I met your father. This Tom Salinger, he was handsome. I remember liking him." Under different stars, my name could have been Salinger! That is something to think about. I would have been Mary Salinger Goldman. Luckily that did not happen because then I would be MSG. Well, enough about J.D. 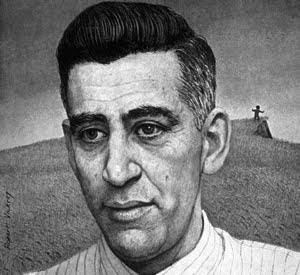 Salinger. Trust me, we are going to be hearing enough about him! Wait -- I thought Kennedy's press secretary was already dead. Never heared of the dude. Harold Ross always vetoed New Yorker pieces about writers with the following: "Nobody cares about the problems of writers except other writers!"